Goblins Well, which was once found about a mile to the west of Mold, is another well with a long history that is sadly now lost to us, finally having fallen victim to a road widening scheme. Goblins Well lay in a field near Maes Garmon farm, the same field where the obelisk stands commemorating the supposed site of the famous Alleluia Victory of St Garmon’s Christian army over the massed ranks of Picts and Scots in around 430. 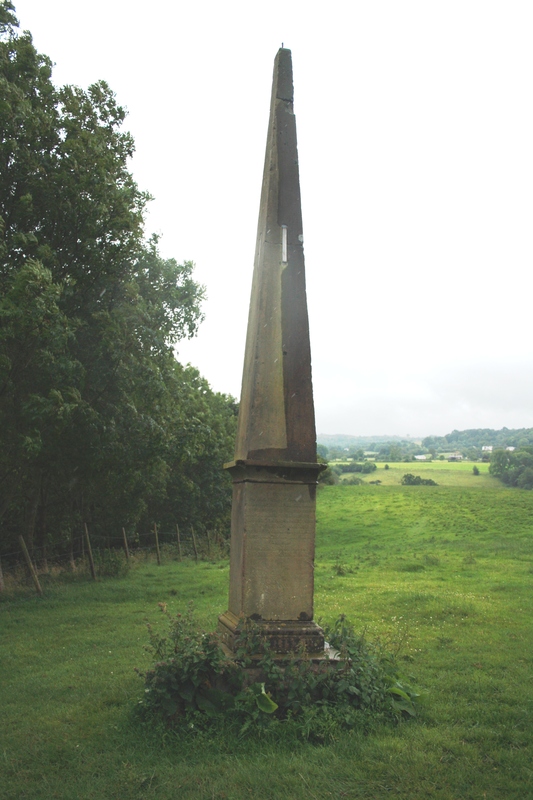 The obelisk was erected, rather fancifully in 1736 by the landowner Nehemiah Griffiths of Rhual. There is certainly no evidence that the battle, recorded by Bede amongst others took place at this spot. Within the field (Maes Garmon) is a stone enclosure, 8 feet by 4 feet, containing a spring called the Goblins’ Well; the stones are mostly displaced, and the bed of the well is trampled by cattle; the overflow is fairly copious. – Visited 21st September 1910. It must have been fading fast even then, for it is no longer recorded when the updated OS Map is produced in 1912, and it doesn’t appear on subsequent maps, although it isn’t until around the 1970s that the road passing by was widened and any last traces of the well obliterated. Despite this the water still appears to reach the surface, a pool on the opposite side of the road a little way down the hill, which has been referred to in comments received below, is said to be fed by the original spring. The name Goblins’ Well presumably links it to the nearby Goblins’ Hill, Bryn-yr-Ellyllon. This was the site of a burial cairn, dated to around 1900 to 1600 BC, close to the River Alun, which was opened in 1833. Its contents included the magnificent golden cape, this was badly damaged when found and much of the gold was shared out among the workmen finding it. Since then most of it has been recovered and the remains of it are now in the British Museum, with a facsimile copy on display in Mold. There were also a large number of amber beads, most of which became collector’s items for the local finders and are largely now lost. There is a long history of the association of ancient burial mounds and supernatural folk such as goblins or fairies. A number of mounds around both Wales and other parts of Britain are similarly named. Francis Jones provides a section on the ghost lore of wells. Women in white (he refers to Ladi Wen) were a common sight, known to haunt not only wells, but crossroads, churches, abandoned houses, fords, hedges and bridges. Ghostly women in white are not unique to Welsh wells. A brief search of the internet shows wells across Britain and Ireland haunted by these figures. Many commentators seek to draw a link between early Celtic goddesses, particularly Brid or Brigid, who is often traced through to St Brigid, after whom many wells across Britain have been named. It is suggested, by those who support the theory of the incorporation of pagan well related customs into Christianity that often Brigid has been transformed into the Virgin Mary as a dedicatee of wells. Marie Trevelyan  wrote that “Wales, in common with England, has innumerable white ladies, and every county of the Principality has several of these apparitions”. However, many suggest that the specific Welsh Ladi Wen is a relatively recent, certainly a post-Tudor, phenomenon, and may be a very different entity to the white lady that haunts the wells The Ladi Wen is often labelled as a specific Welsh bogey-woman, more common in South Wales than North Wales. She is often headless like Holland’s White Lady at Goblins’ Well, and she would be used to threaten naughty children, and would be a commonly expected visitor at Hallowe’en. Clearly the White Lady at Goblins Well is part of a nationwide team of White Lady apparitions. However the well’s white lady isn’t the only ghost in the area. Goblins’ Hill itself has its own spectre. A giant warrior, clad in the gold cape of the burial, was seen a little before the discovery, trying to lead treasure seekers to his hoard. The story, recorded by local vicar Mr Clough, was in widespread circulation very soon after the discovery, and others were soon willing to state that they, or their predecessors had also seen the warrior. This unassuming area on the outskirts of Mold boasts it all, ghosts, wells, golden hoards and historic battles. We knew that the well was no longer there to be seen before we set off, although we found the pool across the road on a subsequent visit,but the thrill of tramping across fields in driving rain, the chance to visit the fabled battleground (or at least to see the monument) and always the outside chance of meeting a ghostly white lady or gold clad knight was probably too good to miss out on. The lack of photos indicates that the spectres, on this occasion, failed to materialise. I no where it is I’ve actually lay in the water myself if any one wants a location or directions I can help. Hi – where have you seen it? Any information would be welcome, thank you. Are you thinking of the pond in the wood on the opposite side of the road? I’ve been meaning to go back and take another look at that. 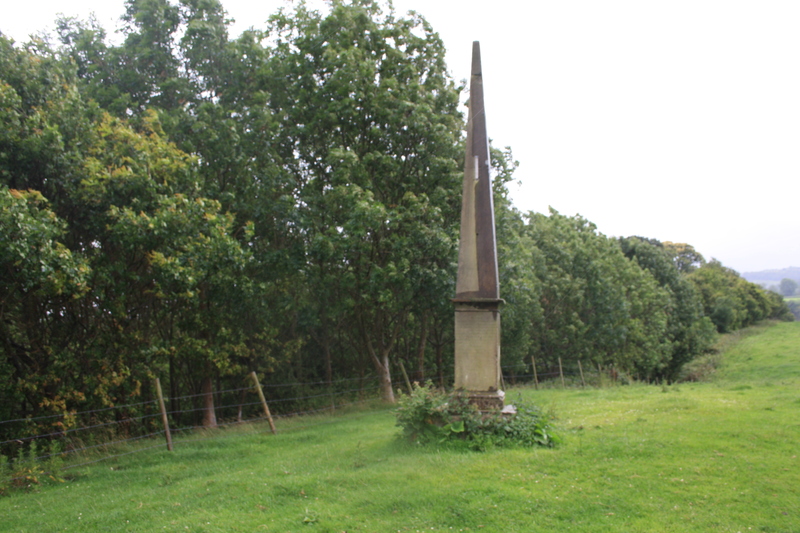 the goblin well is over the road from the monument, its hidden in the undergrowth. Hi, I’ve heard the same from another source recently, I’ve been meaning to go back and have a look. It would be interesting to discover whether this is the original location of the well, or whether this one has emerged since the original was filled in. The water will always look to get to the surface somehow. Thank you for your information.